Ian Hutchinson claimed TAS Racing's maiden win in the Superbike class at the TT since 2008. Northern Ireland’s Tyco BMW team says Ian Hutchinson will make a full recovery from his injuries following his crash in Friday’s Senior TT. Hutchinson came off at the 27th Milestone as he was contesting the lead with Peter Hickman on the second lap, forcing a red flag. Ian Hutchinson on the Tyco BMW at Ballaugh Bridge. The 37-year-old suffered a broken left thigh bone and is being treated in hospital in Liverpool. Hutchinson extended his tally of Isle of Man TT wins to 16 following a double as he won the Superbike and Superstock races for the Moneymore-based TAS Racing team. 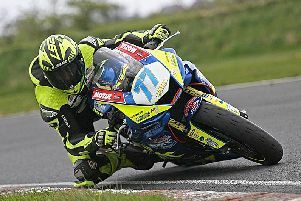 His coveted victory in the RST Superbike race was the team’s first in the class since Australian rider Cameron Donald won the corresponding race in 2008. Hutchinson’s Superstock success on the S1000RR was also his third consecutive win in the class and TAS Racing’s 18th overall triumph at the TT. A statement issued by the Tyco BMW team expressed its thanks to the event organisers and medical staff for their ‘swift action following the incident’. Team manager Philip Neill described this year’s TT as a roller-coaster of emotions but said he was thankful that Hutchinson, who previously sustained serious injuries to his lower left leg in a crash at Silverstone in 2010, would recover. “This year's TT was once again a roller-coaster of emotions. On the positive side we achieved our first Superbike victory together with Tyco and BMW, repeated last year’s Superstock victory on the S1000RR and increased the TAS Racing TT success story to 18 victories while helping Hutchy reach the 16 win mark,” he said. “Unfortunately, the event finished on the downside for us with Hutchy's accident during the Senior race when battling for the lead. Thankfully, however, Ian will recover from his injuries and everyone involved with TAS Racing wish him a speedy recovery.